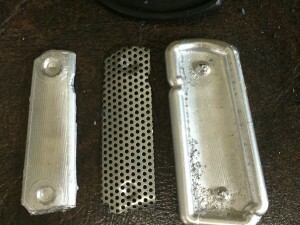 The first attempt to press steel with fixturing alloy. In Part 2 of “The Cool Grips Project” I explained that I figured out a way to make the plastic liner for my grips using silicone molds, but I was still stuck without a way to make the metal part in reasonable quantity without spending 5 figures on forming dies suited to making literally hundreds of thousands of copies. In large measure, the issue is one of prototyping. Given a CAD model for a grip dies, it could be made relatively cheaply. I could probably make it myself. But to determine the shape of the forming die, you need to know the springback for the metal you’re using. You need to account for the fact that the bottom of a 1911 grip has a crease on it, that will stretch the metal (and reduce springback). You need to develop a flat pattern that, when pressed, will stretch and bend in just the right way to give you a completed shape. 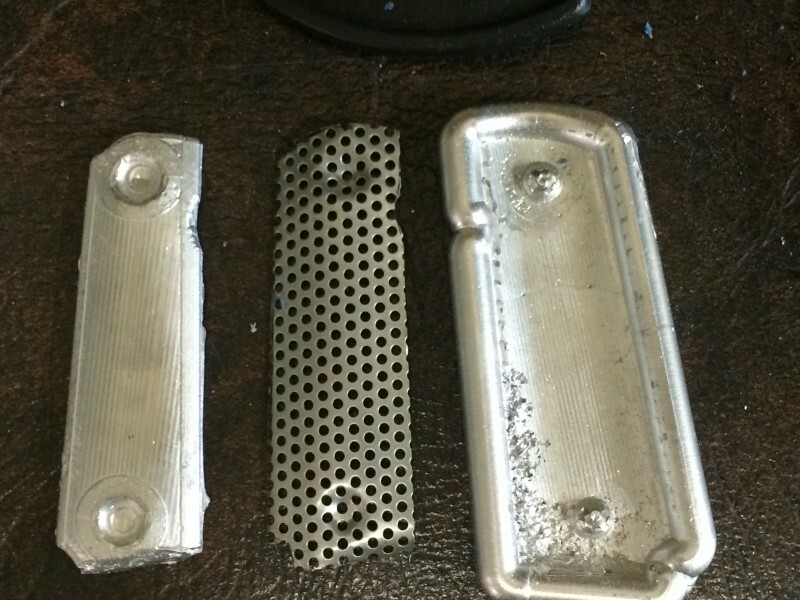 It is this combination of expertise and trial and error that the metal experts charge for. And the experts were pointing at another problem for me: I need the holes of the grips to line up a certain way inside both the cutting and forming dies. Making that happen is (according to them) a non-trivial exercise. So a big part of the problem is that, were I to wish to make dies myself, I would need to cut multiple versions around multiple variables: curvature at the top, curvature at the bottom, methods of hole alignment. I’d also need to try to get the holes lined up right. I set this difficult project aside to focus on my other products, that could be produced more easily. Then I saw an item known as “fixturing alloy” in an Enco catalog. This is a lead-based mix of toxic metals (rather like solder) that melts at the fantastically low temperature of 158° Fahrenheit. You can literally melt it in a bad dipped in boiling water. The catalog suggested that it could be used for short-run forming dies. I would hardly expect to get production out of it (or anything lead-based), but on the key question of prototyping and finding the right shape for a die, it offered a simple solution: cut molds out of HDPE and pour liquid metal into them to make experimental dies. HDPE is soft and has a high lubricity, and can be cut at a vastly higher rate than steel or even aluminum, with less wear on tools. The very first attempt was reasonably successful. As the picture shows, I managed to sort of shape a crudely cut piece of steel to have two dimples (for mounting screws, some degree of curvature, and the beginnings of the crease. With that success in hand, I turned to the problem of developing a more accurate flat pattern and getting the holes aligned properly.